There’s only one other thing I love more than eating amazing food, and that’s enjoying a banging meal with family and friends. When you’re travelling you’ll probably find yourself eating out a lot, but one of the great things about staying in a hostel is that lots of them have awesome kitchens, which means you can get together with some friends, have some fun and cook up loads of healthy and tasty food. In this blog I’m going to share my tops tips for cooking up a storm while you’re on your travels. Wherever you are in the world – whether it’s Sydney, Bangkok, Rome or Hanoi – chances are you can find a local food market. This a great way to explore a new place, meet some local people and get a taste of the food and culture. Some of my best Lean In 15 recipes have been inspired by my travels, and food markets are always a highlight when I visit somewhere new. So when you arrive in a new place, ask your hostel for directions to the best local market and get down there, get inspired and grab some fresh ingredients. 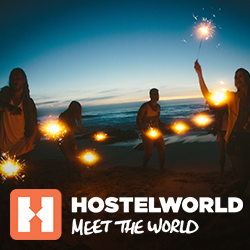 Hostels are an awesome way to meet new people and when you’re travelling there’s nothing better than sharing a meal with some new friends. It’s likely that you’ll eat out a lot when you’re on the on your travels but with access to a good kitchen, why not grab some fresh ingredients and get cooking. It’s fun, cheaper than eating out and a great way to get to know people. And cooking doesn’t mean missing out on the local food either: why not find a recipe inspired by the place you’re in and experiment creating your own local dishes? This one depends on where you are in the world, but lots of places have short cooking courses where you can learn to cook amazing local recipes. I did this when I was I was in India and learned how to make some amazing curries. It was so much fun and it also inspired some of the recipes in my books. You can take your new cooking skills back to the hostel and cook up a storm for some friends or when you get back home. People ask me all the time how I stay on track when I’m travelling and one of the biggest challenges is always the breakfast buffet. Many hostels include free breakfast and this will probably mean lots of croissants, muffins and sugary cereals. I try and avoid these and go for a breakfast high in healthy fats, such as scrambled eggs with spinach and feta cheese. If I’ve already smashed my workout I’ll have some carbs too, such as some toast or a bagel. If you know that your hostel won’t have a healthy breakfast available, stock up on some key ingredients, such as eggs, green veg, cheese, coconut oil, nuts and avocado. With a few hero ingredients in the fridge, you can whip up a healthy omelette or avocado on toast, that will help you win the morning and motivate you to make better choices throughout the day. For a healthy no-fuss dinner that’s super easy to make, try one of my one-tray wonders, like this chicken, chorizo and cauilflower bake. The leftovers always make a great lunch the next day. Talking of stocking up on good ingredients, if you follow me on social media then you’ll know that one of my top tips for staying lean is to prep like a boss. This basically means preparing some healthy meals in advance so you’re more in control of what you eat. You’re naturally going to eat out more than usual when you’re travelling but with access to a kitchen, there’s no reason why you can’t prep some healthy meals when you’re travelling too. If you win the morning you’ll win the day, and mornings can sometimes be a blur which can lead to bad choices when it comes to breakfast. One of my best tips for prepping is to make your breakfast or lunch while dinner is cooking the night before. One of my breakfast heroes is overnight oats, super quick and easy to make and perfect after a morning workout. One of the biggest hostel crimes you can commit is taking food from the kitchen that doesn’t belong to you. Do not go there. But there is one small exception to the rule. Most hostels have a communal cupboard where you might find things like herbs and spices or olive oil that have been left behind or provided by the hostel. Before you go out and get your ingredients, check the cupboards for what you may already have – but always double check that it doesn’t belong to anyone. The post The Body Coach’s tips for cooking fast healthy meals while you’re travelling appeared first on Hostelworld Blog.